Department of Orthopedic and Trauma, El-Minia University Hospital, El-Minia, Egypt. on five patients (two boys and three girls) suffering from severe club foot deformity all with bilateral foot affection. cording to Mittal (1987)  were excellent in eight feet (80%) and good in two feet (20%). certain and its behavior is unpredictable . deformity on normal bone growth [11-14]. external fixator was found more reliable. in management. Certainly the frame described by Mr.
and severe neglected cases of club foot. Surgery. Band 1. Heft 3. August 2003-(199-207). Follow up period from two to seven years. recorded. All cases were idiopathic congenital clubfeet. assessment of the degree of deformity. through the distal part of all metatarsal shafts. Ano ther K.
allel to the first one. to correct internal tibial torsion. proved in 29/4/1997 under No. 20089.
early movement of the toes. slight external rotation) for anther 6 weeks. then the child was allowed to walk. gree of corr ection of deformity and foot stiffness. and the tube directed caudally 30 from perpendicular . ion and ano ther with the foot in the neutral position. (parents of the children gave us most of the above data). clinical results Tables 1(a) and (b)). ground while sitting on the feet). Table 1. (a) Criteria of assessment; (b) Clinical results. any equines or min or degree of deformity. valgus foot deformity (due to over correction). rehabilitation. No bony operation had been done. cases this angle improved in serial follow up X-ray. proved in serial fo llow up X-ray. X-ray  this angle improved in serial follow up X-ray. low up X-ray (Figures 5(a) and (b)). The same case after operation in the fixator (Figure 7). The same case post-operative (Figures 8 and 9). tially be treated non-operatively [20 ,2 1]. after three months surgical interference was advised. treatment had only a false correction of the deformity. calcaneus in the holes of proximal half ring. soft-tissue release, even at the age of 8 - 10 years . Other author s reported an opposite view [24 ,25]. pediment to correction in severe deformities at all ages. traced. On the lateral X-ray to measure the ankle equines. Figure 5. (a) Pre operative X-ray (left foot); (b) Post operative follow up X-ray (left foot). Figure 7. 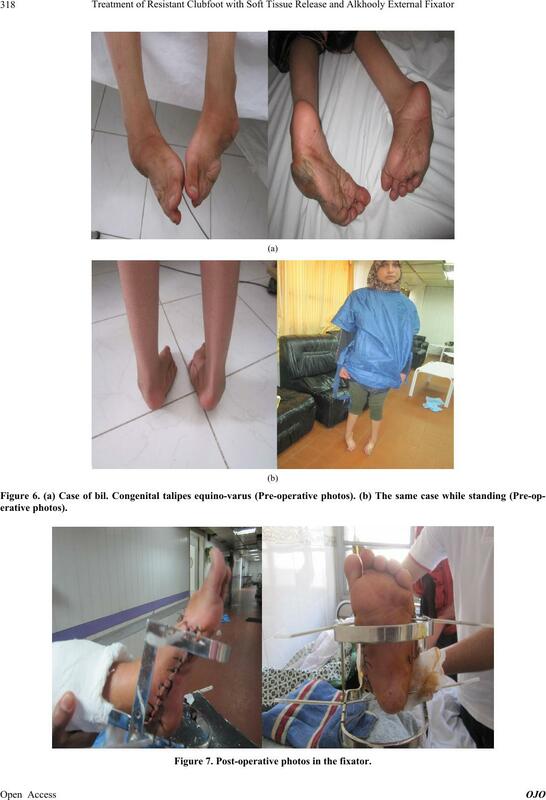 Post-operative photos in the fixator. Figure 8. Post-operative follow up, left side operated and right side not ope r ated yet. Figure 9. Both feet after correction. Our results are encouraging for using this technique. No. 3, 1987, pp. 189-192. & Joint Surgery, Vol. 46, No. 6, 1964, pp. 1217-1225. A. 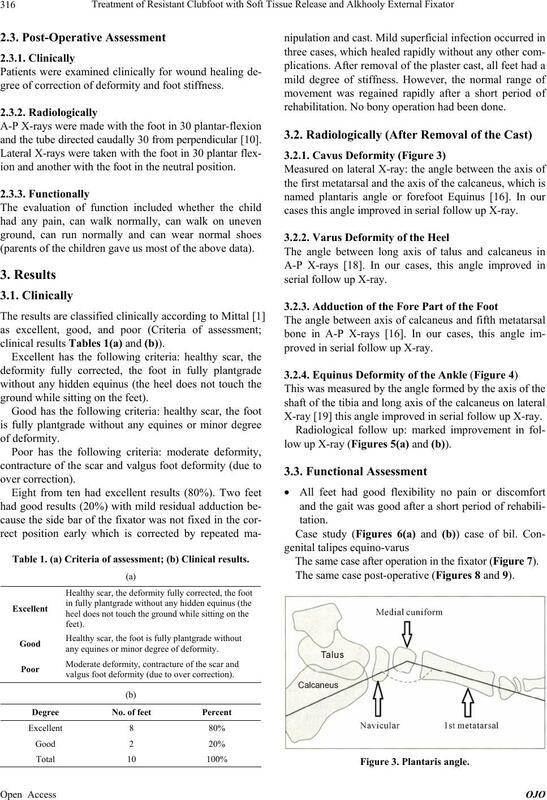 Fried, “Recurrent Congenital Clubfoot: The Role of m.
of Bone & Joint Surgery, Vol. 41, 1959, pp. 243-252. & Joint Surgery, Vol. 41, No., 1959, pp. 821-835. Vol. 45, No. 1, 1963, pp. 45-52. Journal of Bone & Joint Surgery, Vol. 39, 1957, pp. Surgery, Vol. 40, 1958, pp. 252-255. Surgery, Vol. 48, 1966, pp. 40-50.
varus,” The Journal of Bone & Joint Surgery, Vol. 48, No. 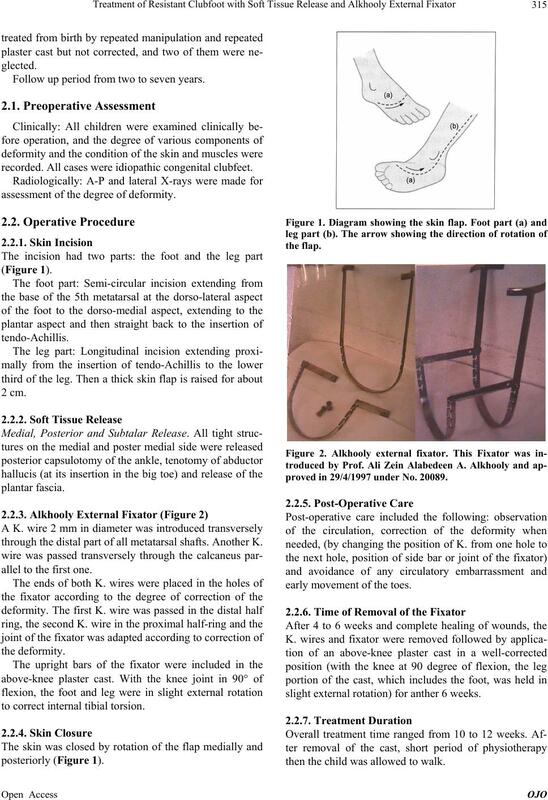 foot,” The Journal of Bone & Joint Surgery, Vol. 53, No. B. J. Main, R. J. Crider, M. Polk, G. C. Lioy d Re berts, M.
Joint Surgery, Vol. 59, No. 3, 1977, pp. 337-341.
foot,” Orthopaedic Clinics of North America, Vol. 9, No. Surgery, Vol. 45, No. 2, 1963, pp. 261-344. Joint Surgery, Vol. 61, No. 4, 1979, pp. 474-480.
Review, Vol. 5, 1976, p. 35. 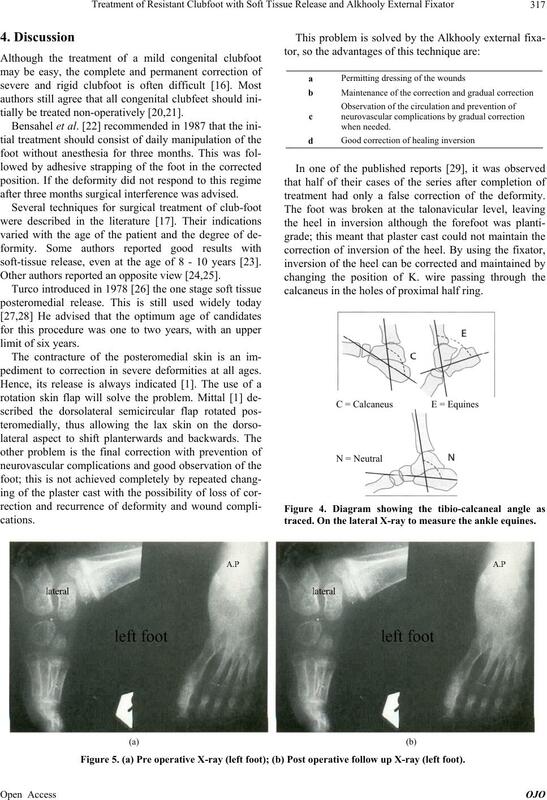 Deformities of the Forefoot,” Clinical Orthopaedics, Vol. H. Bensahel, Z. Csukanyi, Y. 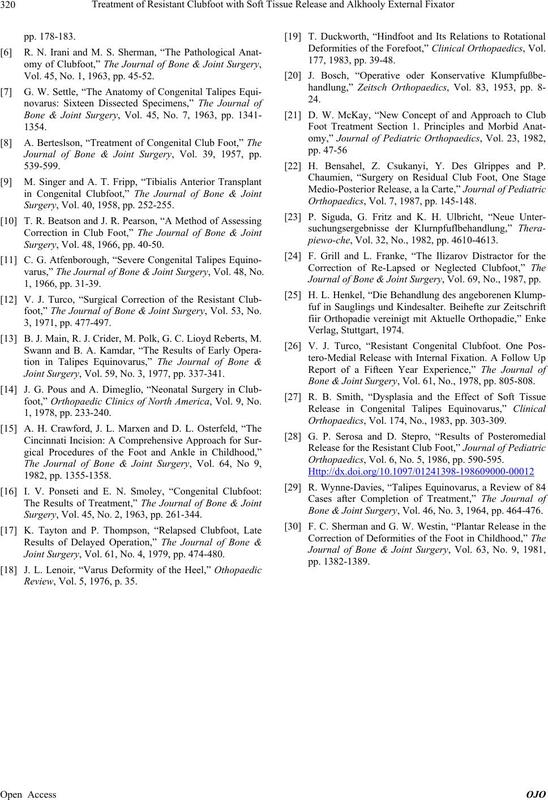 Des Glrippes and P.
Orthopaedics, Vol. 7, 1987, pp. 145-148.
piewo-che, Vol. 32, No., 1982, pp. 4610-4613. Journal of Bone & Joint Surgery, Vol. 69, No., 1987, pp. Bone & Joint Surgery, Vol. 61, No., 1978, pp. 805-808. Orthopaedics, Vol. 174, No., 1983, pp. 303-309. Orthopaedics, Vol. 6, No. 5, 1986, pp. 590-595. Bone & Joint Surgery, Vol. 46, No. 3, 1964, pp. 464-476.